News by Britta S., Ginny W., and Matt S.
Based on the trailer it looks like this will be less of a JRPG like the main-line Hyperdimension Neptunia games, and more of a “spend time with a girl in her bedroom” simulator, a-la Summer Lesson. It’s a newish genre made possible through the power of VR and we, for one, are very happy that such innovation exists. We do assume that where Summer Lesson is actually quite committed to preserving the girl’s modesty (by not letting you look up her skirt and so on), Megadimension Neptunia VIIR will not have the same inhibitions. It is a Compile Heart game, after all. A game based on Kafka's novels — that caught my immediate attention. He's the author of that famous story about a chap called Gregor turning into a beetle. Kafka always called his protagonists simply "K.", and Denis Galanin, the creator of the Franz Kafka Videogame game (yes, awkward, isn't it? ), sticks with that convention. The FKV game has been talked and written about online for nearly 5 years. It even won awards last year. Now that we actually have a Steam page, I am finally willing to believe that it is going to happen. Absurdly and sureally, but really. The PC game is published by Daedalic and the release date is April 6. There are supposed to be iOS and Android versions coming as well, but we don't have any reliable information on these releases at this stage. Whoever thought girls getting wet would be so exciting? Senran Kagura: Peach Beach Splash is just around the corner in Japan. This is a shooter we can get right on board with: a shooter where you replace guns, bullets, and exploding heads with girls, water pistols, and shirts that get quite incredibly see-through when they get wet. The appeal is most obvious, no? We've already predicted that people will be offended. Ahead of the launch in Japan, publisher, Marvelous has launched a minigame that can be played on your phone browsers. It’s a very simple game, but so very beautiful to watch. You flick your phone’s screen, which shoots water at a girl, resulting in her clothes getting wet and see through. There are seven stages, each featuring a different girl, and when you clear the state you unlock a promo video for that girl. There are also bonuses to unlock by playing, and these are great; you are just four million flicks away from one really awesome wallpaper for your phone! If all this sounds good to you (and we don’t quite know when the game will be released in the west, so this might be the way to go for now), then here’s the link to the game. Remember, it’s only playable on phones. Enjoy! Hey, this ain’t no squirting matter! 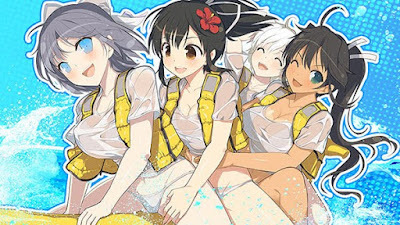 This week brought the release of Senran Kagura: Peach Beach Splash to the lucky folk of Japan. If you’ve followed the franchise then you’re probably excited for what looks like a festival of wet t-shirts and wetter girls, but don’t fret! Marvelous Entertainment has released new gameplay footage to give us all a taste of what’s to come, and it’s a whole 35 minutes of titillating gameplay (every pun intended). Hot on the heels of the Peach Beach Splash mobile game that was recently released (in a brilliant stroke of marketing strategy, I might add), we get to see the intro, the various menus, and some excellent cinematics that set the scene. If you’re not in it for the swimsuits, you’ll be happy to know that we also get to see a healthy amount of tutorial footage and some ninja art abilities. We all knew that the combat in the game was going to be dynamic and flashy, and fans are going to lap this half hour of content right up. Western followers of the Senran Kagura girls are going to have a bit longer to wait until they can get their hands on Peach Beach Splash in all its perky glory, but for now, this should be the shot in the arm that we need to get by.